in the spirit of the solar eclipse, spanish artist isaac cordal has sent designboom his project ‘cement bleak’, a street art intervention he first initiated a few years past in dalston, london, england. 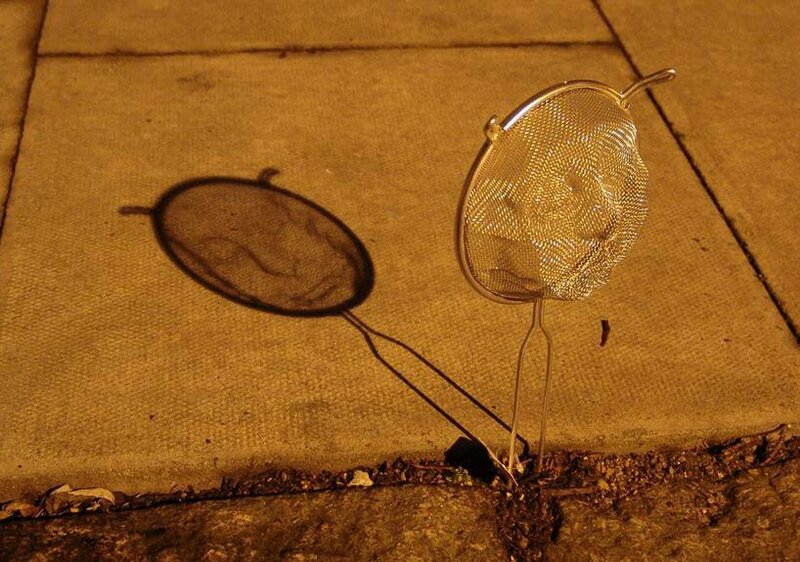 the urban public art installation employs the illumination from street lamps casting shadows upon manipulated metal cooking strainers, propped up by the handle of the piece. 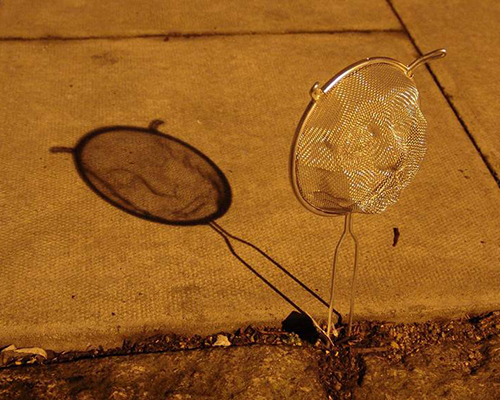 three small faces have been modeled on metal sifters and as the light passes through the netted cookware piece, the end point of this luminosity a three-dimensional seeming face on the sidewalk. the piece began as a test implementation of what the artist hopes will be a larger shadow projection project using the resource of city lighting in darkened streets. in the three strainer sculptures, the artist is investigating the representation of the human face by reinterpreting three dimensional spaces with the help of digital mapping. the artist is ‘interested in using lofi technologies to create complex results arguing about the abuse of usage we make with new technologies in many cases’. Discovered, at least, the mistreat of Sacra Sindone!…. …la importancia de VER mas allá de….